Isn't there something almost "fun" at times about being politically incorrect? Some people don't even realize there are "politically correct" and "politically incorrect" things that go on in the dog world! The dog in this photo is "Mikey". I was asked, by a grooming client of mine, to go with her to pick out a black Standard Poodle pup for her mother. Her mother wanted a black puppy, so that is what her adult daughter picked out for her. But in the same litter was this gorgeous brown and white boy. I honestly found him fascinating. Poodle people who show primarily in AKC conformation events, are almost always "anti" any colors other than solid colors. The powers-that-be at the Poodle Club of America determined years ago that not only parti-colored Poodles, but even those with just a tad of white (such as a black Poodle with a small splash of white on his chest) would not be allowed to compete for AKC championships. There are still some Poodle breeders who "cull" (kill) "mismarked" puppies at birth, because they do not want their peers to know that their breeding stock is producing puppies other than the desired solid colors. Parti-colored Poodles can be shown in AKC performance events, such as obedience, Rally and Agility events. And since they can have AKC registration, breeders may breed dogs of any coloration and as long as they are purebred Poodles, they may be registered AKC. But although they have AKC registration, they may not be shown towards an AKC championship. Some folks don't realize that there are organizations other than the AKC that offer dog show events. The United Kennel Club voted a few years ago to allow multi-colored Poodles to be shown in conformation, so if you happen to love parti-colored Poodles and you are searching for a reputable breeder, a good place to start is to go to UKC shows and get to know some breeders personally. If you happen to enjoy showing dogs, and you purchase a dog that ends up having the proper Poodle "type" and structure to make be competitive, you can enjoy showing your dog towards his UKC championship! And another big bonus (in the eyes of some of us) is that UKC allows Poodles to be shown in clips that are much more "normal" than the haircuts we see in the AKC Poodle ring. Is a parti in your future? If you happen to love them, then my best advice is to start your search long in advice of the time when you feel you must have your next Poodle. Because Poodles of this coloration are quite beautiful, many of us fall in love with the parti-colors after we have seen one, they have gone up in value. Standard Poodles used to be very rarely found in puppy mill situations, but unfortunately now, through the internet, a "commercial breeder" can make themselves look very professional just by posting some beautiful photos on a website. MAKE AN APPOINTMENT AND GO VISIT THE BREEDER if you see a website with lovely dogs and you have interest in purchasing one. If the breeder will not allow visits to their home or kennel by appointment, then don't buy from them, period. PLEASE PURCHASE ONLY FROM A REPUTABLE BREEDER and please do not make an impulse purchase! I know how easy it is to see a gorgeous dog and buy it without thoroughly thinking through the process. "Mikey" was formerly "Pete" and he lived at my home for a few months before he found his forever home with Linda Lee Earl and her wonderful family. Why did I let him go? Because I actually already had a houseful of dogs when I saw Mikey. We had just moved to a new state and were getting settled in to our new location, plus we had lots of family things going on. It simply was not a great time to add another big dog to the family! When Linda Lee fell in love with him, it was a bittersweet moment. It was one of those "divine appointment" moments when we met in the veterinarian's office one day...long story, but I helped her with a rescue dog and she gave me the gift of providing the best home ever for the big parti-colored boy I had purchased on impulse. "Pete" had to have a name change, because Linda Lee's husband is Dr. Peter Earl, and two Petes in one family was a bit much! 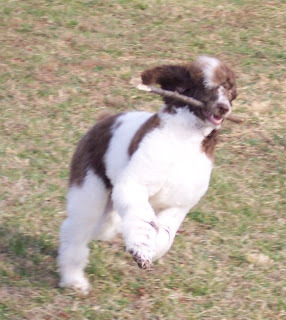 Mikey also did not come from a breeder who was involved in pedigree research, nor did his breeder do all the health clearances on the sire and dam of the litter that are recommended by the Poodle Club of America. I had purchased my other Poodles from show breeders. Thank heavens Mikey was just naturally blessed with an outgoing, lovely temperament. Since he came from a commercial type breeder who was breeding totally for the purchase of making money by selling various breeds of dogs...it was totally by the grace of God that he ended up being such a sweet, healthy dog. Poodles, especially the Standard variety, are plagued by many hereditary health conditions. Poodles come in all sizes and all colors. Breeders also come in all varieties! Make sure you choose to purchase your next Poodle from a reputable breeder, or an ethical Poodle Rescue group. For more information on the history of parti-colored Poodles (some of the earliest paintings of Poodles are of black and white dogs), be sure to visit Charlene Dunlap's website, www.caninehorizons.com. Charlene is not a breeder, but she has done a lot of research on all things Poodle, and you will definitely enjoy the videos and articles on her website. 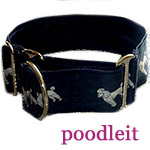 Plus you just might fall in love with parti-colored Poodles after seeing Charlene's lovely dogs!